The Republic of Haiti is a poor country and its economic condition has affected telecommunications. Natural disasters also had a negative impact. 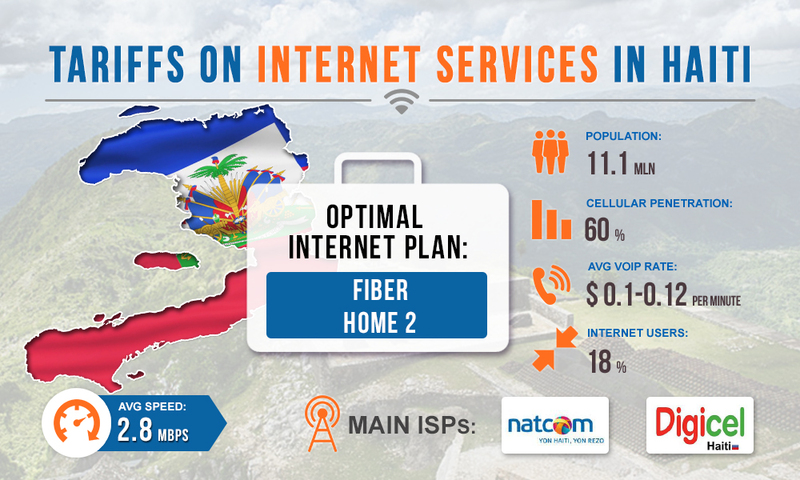 The mobile sector in Haiti is developing well, but poor fixed-line infrastructure does not speed up the Internet penetration. Nevertheless, connecting the Internet for effective VoIP termination is still possible in the country. Let's discuss the tariffs for Internet services in Haiti. The main Internet provider in the country is Natcom, which also provides cellular services. The operator has a range of packages called Fiber To The Home (fiber-optic Internet). Fiber-optic technologies are best suited for traffic termination, since this type of Internet is considered the most stable, which means that the equipment will work without interruptions. This is important for earning on the landing of international minutes. Fiber Home 1. Speed - up to 2 Mbps, connection - free, subscription fee - $50 per month. Fiber Home 2. Speed - up to 4 Mbps, connection - free, subscription fee - $90 per month. Fiber Pro 1. Speed - up to 12 Mbps, connection - free, subscription fee - $300 per month. As you can see, the prices for the Internet in Haiti are quite high. But with good internet voip rates in this direction, the expenses for Internet services will be acceptable. We recommend choosing Fiber Home 2 package at speeds of up to 4 Mbps. This is enough for normal operation of the multi-channel gateway in one location. Subscription fee of $90 will not be too burdensome for the terminator’s budget, given the average earnings of $200- $600 from each channel.